This is a large two story home built in the 1920s (2,600 Sq. ft.) and is as 'Dramatic' as its views of Lake Pepin. A complete remodel of this charming home was completed in the Spring of 2014. It now has all the charm and character (Coastal & Nautical) of our other vacation home rentals in Lake City. A new kitchen with stainless steel appliances, solid granite counter tops and a wonderful laundry/pantry just off the back of the kitchen. There is also a very unique Cafe area, a large family room and a lovely 3 season porch toward the back of the house. Two (2) newly remodeled full bathrooms with ceramic tile throughout, four (4) bedrooms (5 bedrooms when the beautiful barn door is pulled to convert the living room into a fifth bedroom). The living room is quite spacious and has lots of seating, an electric fireplace, a queen size leather sofa-bed and 'dramatic' views of Lake Pepin. The home has four (4) HDTVs, 2 BlueRay DVDs, cable and wireless internet. The main floor has a large living room with a wonderful bow window & window seat offering 'dramatic views' of Lake Pepin. There is a queen leather sofa bed and lots of additional seating, plus a large flat screen TV and an electric fireplace. The large dining room is furnished with a custom made farmhouse table that comfortably seats 12 and also offers magnificent views of Lake Pepin and the Wisconsin bluffs across the way. There is a first floor bedroom with a king-sized bed. The remodeled kitchen features granite counter tops, stainless steel appliances and a unique Café space off the kitchen with a pass thru counter between the Café and the kitchen. The Café features a counter high gathering table that seats 4. It's a great space for coffee, dining, games, cocktails and, of course, just hanging out. A large laundry room/pantry is just off the kitchen and has great additional storage for all those vacation goodies everyone brings on vacation. Off the Café toward the rear of the home is a second large living space or 'family room' that features another large flat screen TV, lots of seating and a beamed ceiling. The family room also has a dramatic view of Lake Pepin with a second wonderful bow widow seat. Just off the family room is a very comfortable three season porch and off the other side of the family room is an attached, spacious two car garage. The large first floor bathroom has an over sized walk-in shower. Off the family room and kitchen is a nicely protected, large outside patiowith a European style pergola (summer of 2015), a fire pit, a stone wall, a pedestal lamp and lots of outside seating, plus a gas Weber grill. This arrangement offers the perfect outdoor setting to relax, relive the fun day and to enjoy Family, Friends, and the Dramatic Views of Lake Pepin all over again. 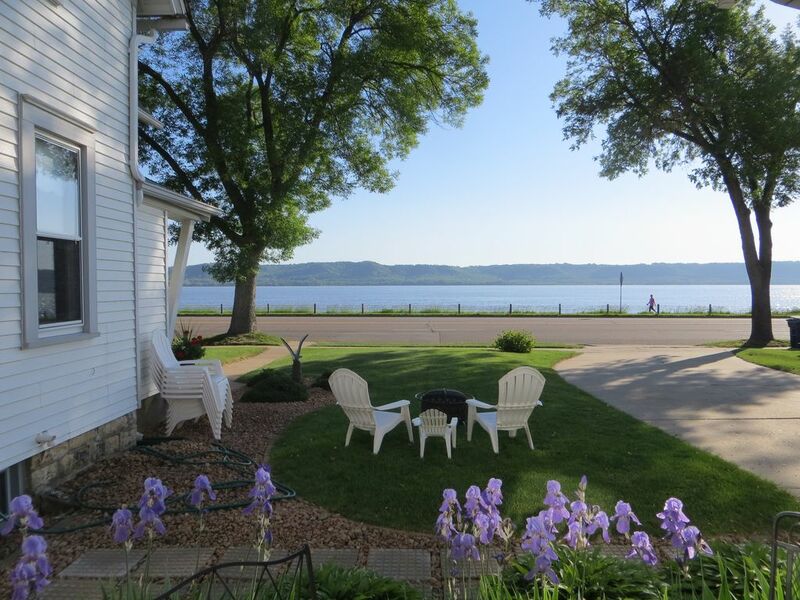 The second floor has Three (3) Additional Bedrooms - Bdrm #1 - A lovely room with a queen-size bed, as well as, dramatic views of Lake Pepin and the beautiful bluffs across the Lake. Bdrm #2 - A charming small bedroom with two (2) twin beds tucked into their respective alcoves. Bdrm# 3 - A large bedroom with a queen bed and two (2) twin beds. There is also a newly remodeled full bathroom with a tub/shower on the second floor. All linens are provided and the kitchen is fully stocked with everything you should need. Rates include cleaning/housekeeping & all linens are provided. Our reservation policy for the months of June, July & the 1st 2 weeks of August requires a one (1) week (Friday to Friday) stay. We own and operate four (2) Coastal Style Vacation Rentals in Lake City which are all featured on VRBO. .
We own and manage four (4) 'vacation rentals' in Lake City and this is our newest and largest Vacation Rental (sleeps 2 to 12). This home is so unique in so many ways and its decorating is consistent with our 'Coastal Style' of furnishings. While visiting Minnesota's South Shore you will feel as though you're experiencing a bit of New England's charm. Lake City is a very unique community and has the characteristics of a Seaside Community along the New England Coast. This spacious property is very much like a home you would find in the Coastal Northeast. The home comfortably sleeps from two (2) to twelve (12) and is conveniently located to everything in Lake City. Downtown is within walking distance, and did I mention that its views of Lake Pepin are quite Dramatic? Lots and lots of living & dining space. A large living room, a large family room, a Café off the kitchen and a dining room with a custom built farmhouse table that seats twelve (12). An attached two car garage and a lovely outdoor patio and grilling space. Completely remodeled bathrooms. The main level shower is quite large and a walk-in. The second story bathroom features a tub/shower. 4 HDTVs, 2 BlueRay DVDs, Cable with music channels and high speed wireless internet. Girls weekend at this house was wonderful. Everybody had a bed, two big bathrooms, 2 sitting rooms, huge dining room table where we ate and yakked all night and a kitchen with all the accoutrements. Beds were beautifully made and very comfortable. Lots of seating everywhere and a couple of televisions if you wanted to watch a movie. It was a bit too chilly but if it was warmer we would have gone for a bike ride with one of many big tire bikes in the garage. Shopping in Lake City and Redwing for something to do. Pottery Place in Redwing loaded with three floors of antiques if that’s your interest. Will go again. Loved it. I've stayed here before for a family girls weekend and most recently again for a couples getaway. We were all so impressed at how organized, clean and comfortable this home is. Beautifully updated and decorated with a nautical beach house theme through out the home, there is plenty of room (and rooms) to move around in. The well stocked kitchen made it easy to make our meals and snacks. The 7 beds and 2 bathrooms easily fit our group of 6. The front living room and the back living room were equally as comfortable to gather in. Sharon was very easy and wonderful to work with. Be sure to visit Sharon's gift shop in town, The Pearl Button. We are looking forward to the next time we need a getaway weekend as we will surely be coming back! Everything about this home is awesome! The location is great, the set up of the home is wonderful and they have everything you will need there. Our family stayed for three days and loved every minute of it! Terrific Property, Great Weekend Family Getaway! Stayed the weekend after Thanksgiving with our extended family. Very nice home, beautiful location/view of the lake. Big enough for our larger group/family with lots of separate spaces if anyone wanted space. Nicely appointed/furnished, clean, and by far the most complete VRBO kitchen we've ever seen with cookware, dishes, and so forth to spare even for our group of 7! We especially loved the window seat looking over the lake in the living room and the large dining table - it was great for meals, conversation, and rousing evenings of table games! The owner came and checked us in, made sure we knew where everything was and how it worked, and gave us some nice recommendations for local things to do and places to eat. Lake City is more popular in the summer, we know, but this was a TERRIFIC getaway even if it was in November! It really is a perfect property for a large group.... we have all the special touched to make it comfortable. The details in this home were so much fun, there was plenty of room to spread out, and it was in a fantastic location. Great restaurants and shopping are nearby but without the bustle of a bigger town. We had a blast and hope to be back! Loved the house, had everything we needed plus more!